Tents belonging to aid organizations are seen after Cyclone Idai at Guara Guara village outside Beira, Mozambique, March 22, 2019. The president of Mozambique, Filipe Nyusi, has visited the country's coastal Buzi district, one of the areas most damaged by Cyclone Idai. Nyusi flew over the Buzi district Friday afternoon to get a bird's-eye view of what is considered the country's worst natural disaster in the last 50 years. The district is almost entirely under water after Mozambique's coast was slammed last week. Winds of 160 kilometers per hour (100 mph) and floodwaters six meters (10 feet) deep swamped Mozambique's coast, killing hundreds of people and leaving tens of thousands stranded on high ground and rooftops. Nyusi told residents in the area the government was doing everything it could to rescue those trapped and assist those who lost their homes. He said the major concern of the government was to rescue people surrounded by water and to provide food, clean water and shelter. Survivors of Cyclone Idai in a makeshift shelter by the roadside near Nhamatanda about 50 kilometers from Beira, in Mozambique, Friday March, 22, 2019. Nyusi said he spoke to Angola's president, João Lourenço, who promised to send about 100 doctors to provide medical aid and help avoid the risk of disease outbreaks such as cholera and malaria. 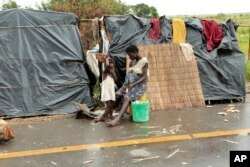 Government buildings in the area have been transformed into shelters for Mozambique's flood victims. Nyusi visited some of the evacuation centers to assess conditions, offer condolences and promise more help. The leader called for unity, and urged all Mozambicans to send support. Nyusi offered thanks for the compassion shown by countless countries that have sent support. These include members of the Southern African Development Community and the European Union, as well as Brazil, Britain, China and India, among others. Nyusi thanked those who have saved lives and given food and clothing to cyclone victims. He is scheduled to visit other areas of the country affected by the devastating floods. The death toll from the storm stood at 293 but was expected to increase.